Project Appleseed: What is it and what does it teach? Back in November, I attended a Project Appleseed rifle marksmanship clinic in Rising Fawn, GA. 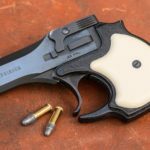 It was just one of the dozens of similar clinics hosted by Project Appleseed nearly every weekend of the year in locations all over the country. Details of the event in the video below. Project Appleseed started back in 2006 with the goal (according to their website) of “teaching every American our shared heritage and history as well as traditional rifle marksmanship skills”. What this means in practice is that if you attend a Project Appleseed, you’ll learn how to shoot a rifle, and you’ll learn a thing or two about American Revolutionary War history. In between the shooting instruction and drills, the instructors take a few “time outs” to share stories that revolve around specific individuals who played an important part in the the American Revolution. I have found that the history and heritage part of Appleseed’s goals tend to inspire skepticism in people who have never attended one of their events. When I’ve explained Appleseed Project to people (both shooters and non-shooters), the reply I often hear is “yeah, but what’s their real agenda?” I don’t know what they’re expecting, exactly. Maybe some weird cult or multi-level marketing scheme? But I’d be lying if I said some of the same thoughts didn’t pop into my own head before I attended myself. However, after having gone through a full weekend event with these guys, I have to say that if there is some hidden motivation at Project Appleseed, they’re doing a really good job of keeping it hidden. I consider myself a naturally skeptical person, but I never got the impression that the Appleseed guys were trying to push a secret agenda or indoctrinate the students with any particular political opinion. As far as I can tell, the reason behind sharing the “war stories” is to give people a clearer picture of why the colonists chose to revolt against the British, and what they sacrificed in doing so. I believe the intention is that these stories will inspire Appleseed attendees to be less complacent about their own political beliefs, whatever they may be. Owning and shooting guns is awesome, and it’s a freedom that’s on full display at Appleseed. If you enjoy that right, and your other freedoms, then you don’t have the luxury of ignoring what our lawmakers are up to. That doesn’t sound very scandalous to me. It sounds like common sense. But back to the shooting part. The marksmanship instruction from Project Appleseed is along the lines of what you might see at a High Power match or CMP event. The program revolves around classic American military rifleman standards that go back to the WWI era. Students learn how to shoot from standing, sitting/kneeling, and prone positions using a GI web sling looped around the support arm. At most events, shooters take position at the 25 meter line and shoot .22 LR rifles at scaled-down targets to simulate longer distances. Some Appleseed clinics include the opportunity to shoot at longer ranges with centerfire rifles, but that’s not really necessary in order to learn the skills. 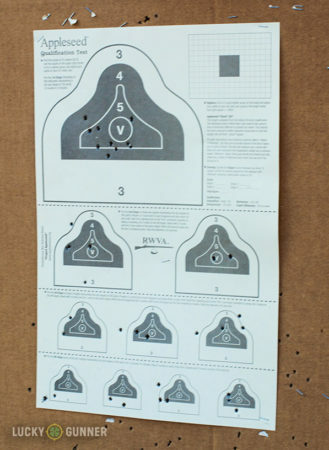 Veterans of long distance Appleseed clinics have often said that shooting the full distance is not as difficult as hitting the small targets on the 25 yard line. 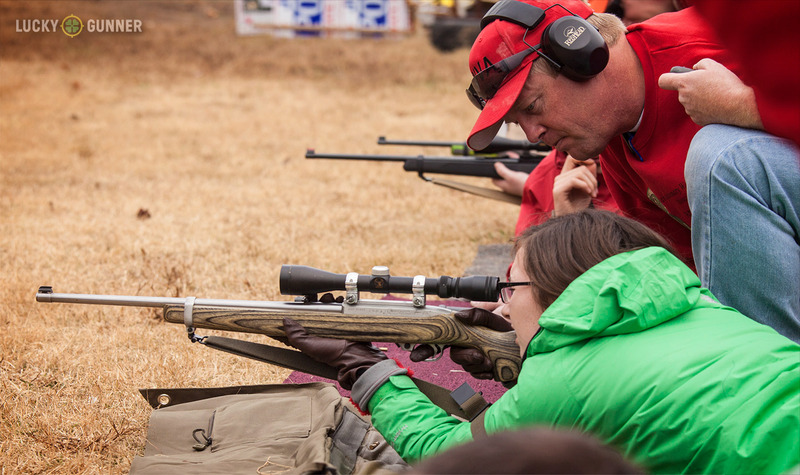 Participants brought a wide variety of rifles, but most stuck with something close to the standard that Appleseed has dubbed the “Liberty Training Rifle“. That’s basically a semi-automatic .22 LR rifle with 10-round magazines equipped with sling studs, a GI web sling, and aperture/peep sights. The most common rifles were variants of the Ruger 10/22 and the Marlin 795. I saw a lot of these modified with peep sights from Tech Sights but there were probably an equal number of students using some kind of magnified optic. Either will work for Appleseed, though personally I think an optic with a minimum magnification greater than 4x might actually make things more difficult at 25 meters. Most of the instruction seemed to be weighted more toward the use of peep sights, and unless you have some vision issues, that’s probably the way to go. I spent the majority of Project Appleseed staring at one of these from the 25 meter line – the Appleseed Qualification Target, or AQT. The first day of the two-day clinic was spent going over the basics of marksmanship. In addition to the three shooting positions and use of the loop sling, we also covered the “Six Steps to Firing a Shot” which is Appleseed’s way of breaking down the fundamentals of rifle shooting into easily digestible and repeatable steps. There were plenty of opportunities to ask questions, check and re-check rifle zero, and make sure everything was understood before moving forward. In fact, if I have any criticism of the whole weekend it would be that the first half of the first day went by pretty slowly, but that’s to be expected in a large class like the one we had. I would rather things poke along at the beginning than to have class held up later on because the less experienced shooters didn’t catch the basics at the start. By the end of day one, we moved on to the AQT, which is one of Appleseed’s primary teaching tools. The Appleseed Qualification Target consists of four strings fire, ten shots each with a break in between each string to reload magazines. Each string has a different time limit and is shot from a different position (with the exception of the last two, which are both shot from the prone position). The highest possible score is 250, and any score of 210 or better qualifies the shooter for a Rifleman patch. 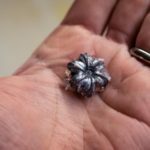 It’s a score high enough to be a challenge for any shooter, but achievable enough that most Appleseed events will have at least a few Riflemen. 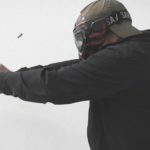 This makes the AQT a great tool because it provides the chance for practice and repetition, but also doubles as a skill assessment and gives the shooter a goal to strive for. The greatest strength of the Appleseed program is the instructors themselves. To start with, there are a ton of them. Our firing line was packed with close to 30 shooters, but we had 7-10 instructors and assistant instructors helping everyone out at all times. That kind of instructor to student ratio is almost unheard of at most other firearms training venues. At our clinic, the generous ratio helped make sure that the crowded range stayed safe and that everyone got the most out of the instruction time. Shoot Boss Nathan Hurst debriefs the group at the end of day one of shooting. On top of that, the lead instructors are very thoroughly vetted before being permitted to run an Appleseed clinic on their own. Requirements include long hours of instruction, apprenticeship, and high standards for marksmanship. The lead instructor we had was a prime example of the result of this rigorous process. Despite it being his very first Appleseed as the “Shoot Boss,” or lead instructor, Nathan “Spartan” Hurst ran the thing like he’d been doing it for years. And if he ever skipped a beat, you would never have known it, because one of the several capable assistant instructors would have stepped in to save the day. Appleseed is great instruction for all skill levels, it’s cheap, and it’s family-friendly. Our clinic had 10 year old kids participating, as well as folks who had been shooting for decades. Looking around at the targets, I think everyone was challenged, and everyone learned something. Check out the Appleseed schedule to find out if there’s one near you coming up this year. Did I Earn a Rifleman Patch? You’ll have to come back later this week to find out. I’ll be sharing a little more about my personal experience with Appleseed, as well as a few of the biggest lessons I learned at the event.